Saint Charitina lived in the third century. She was the slave of a rich man named Claudius, who appreciated her and respected her for her character and charisma. Truly, her way of life made her worthy of love, because she was hardworking, conscientious and behaved with respect and love towards her master, as well as her fellow servants. It did not take long to uncover the fact that she was a Christian, because it was evident from her behavior. Her way of life and behavior differed from the pagan slaves, who for the most part had antipathy and hatred for their master and continuously fought among themselves. When Saint Charitina was arrested, Claudius put on a garment of hair as a way to show that his mourning and his inconsolable weeping. The Saint comforted him and he begged her to pray and intercede for him when she is placed in the chorus of the Holy Martyrs. The king Dometius, because he failed in his attempt to persuade her to renounce Christ and sacrifice to idols, ordered that her head be shaved. Because her hair grew back again, he angrily ordered that burning coals be put on her head and then for vinegar to be poured on her scathed scalp. They then burned her sides with lit lamps. Through all this she remained unscathed. A stone was then tied around her neck and she was thrown into the sea. But when the tyrant saw that she did not drown as expected, he devised an evil plan. He decided to enclose her in a brothel to be corrupted, disparaged and shamed. The Saint fervently prayed to the Lord for this outrage not to take place, so Christ immediately received her pure and clean soul. First, the way of life and the behavior of the Saint influenced her master to the point that it caused him pain and grief that his servant was arrested. And let us not forget that this took place at a time when the slave trade flourished, and slaves were considered things that a master could use for whatever he wanted. He could even kill his slaves without being obliged to give a reason to anyone. But even to her fellow servants she was an example worthy of emulation and it was very natural for the well-intentioned to be positively affected and to change for the better. The venerable Anthony the Great calls people who can pacify the undisciplined in order to love the words of the disciplined, as well as those who are able to heal and change the lecherous to make them love virtue, makers-of-men (ανθρωποποιούς). He calls them makers-of-men because, as he stresses, they regenerate men. "He ought to be called a maker-of-men who is able to tame undisciplined men, so that they will love discourses and discipline. Similarly, they ought to be called makers-of-men who change those who lead an intemperate life, so that they live in a virtuous and God-pleasing manner, inasmuch as they regenerate these men. For meekness and self-restraint are happiness and good hope for the souls" (The Philokalia, "Counsels on the Character of Men and on the Virtuous Life", 11; published by the Institute For Byzantine and Modern Greek Studies). In this sense, the Holy Martyr Charitina can be called a maker-of-men, as well as all the saints, since having been healed of their passions they were able to heal and regenerate spiritually the well-intentioned and struggling believers. Second, God allows trials and temptations for our perseverance and the salvation of man, but He does not allow anyone to go through trials that are beyond what they could handle. Also, He does not allow the devil to tempt man uncontrollably, but He sets terms, conditions and limitations. When Satan asked permission to tempt Job, God allowed it so that the deep faith of Job could be revealed and by this become a model of patience and perseverance, but under conditions. It was unequivocally stressed to the devil to "preserve his soul". And in the case of the Holy Martyr Charitina, God allowed her to be tempted and tormented that she may shine "as gold in the furnace", and thus become a model of faith, patience and prudence, but it was done to a certain point. When the devil wanted to hurt her soul, He intervened and took her to the heavenly mansions, lest she be corrupted, and in this way her purity and virginity were preserved. Moreover, this event shows that God is the One who directs the personal life of every person and cares diligently for their salvation, without of course violating their freedom, which He respects more than anyone else. But there are some people in our time who desire to arrogantly become gods and makers-of-men without the grace and power of the true God of Revelation and the Church, with the result that they create many problems in human relationships as well as many social anomalies. Of course, the purpose of human life is to reach theosis, but this is done through our organic integration in the Church and our experience of a particular way of life, and naturally through the energies of the Holy Triune God; because God energizes our theosis and salvation and man synergizes. 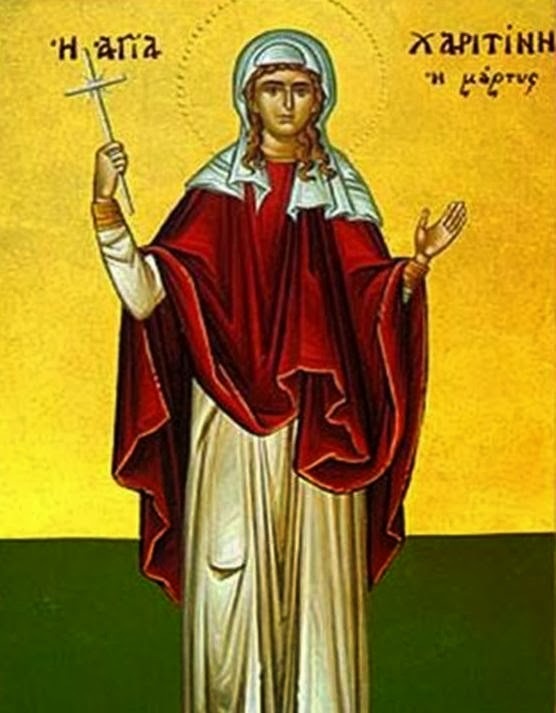 Through the intercessions of the Holy Martyr Charitina, may we too experience the authentic life in Christ as expressed by our Orthodox Church, that we may be made worthy to become true people and makers-of-men. Source: Ekklesiastiki Paremvasi, "ΑΓΙΑ ΜΑΡΤΥΣ ΧΑΡΙΤΙΝΗ", October 2005. Translated by John Sanidopoulos.